On July 19, 2018, the Village of Westmont Board of Trustees voted to approve plans from FMC Aquatic Opportunities and the Westmont Park District for a world-class natatorium project at 660 Blackhawk Drive, adjacent to Ty Warner Park. The natatorium project was previously approved to be built on the Oak Brook Hills Hotel & Resort property, but was relocated after a variety of development challenges. Mary Ann Kaufman with FMC Aquatic Opportunities said, "Making swimming accessible to as many children and adults as possible has long been a dream of mine. I have seen first-hand the positive effect swimming can have on children and their development. 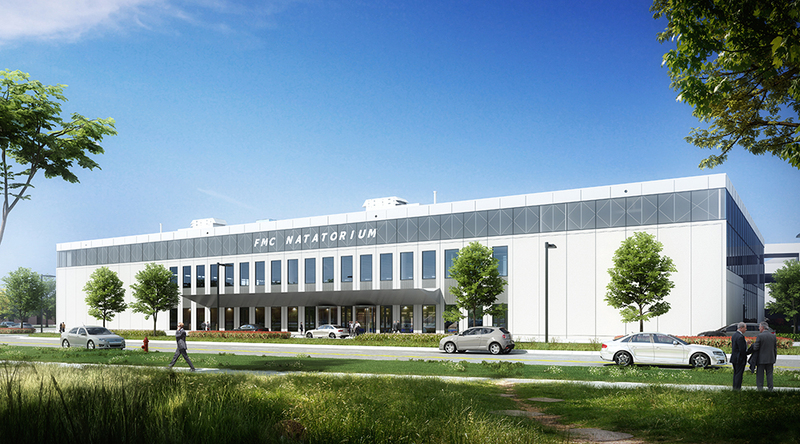 Locating the FMC Natatorium at Ty Warner Park will enhance this already beautiful recreation area and feels like a natural, synergistic fit. I want to thank the Village of Westmont for working closely with me and the FMC Aquatic Opportunities team to make this dream a reality." Nearly identical to the previous approvals in building design, the new location gives the building a new presence and importance on the currently vacant site. The 60,000 square foot aquatic center will include a 9-lane, 50 meter competition pool with spectator seating for 1,200. The facility will also include a 25 yard training pool with a primary use for swim lessons and learn to swim programming. The new design does not include the multi-unit, high-end residential development, which was part of the original proposal slated for the Oak Brook Hills property.